Whitney Houston’s mother, Cissy, provided the emotional highlight of Sunday’s ceremony as she sang “Bridge Over Troubled Water” in tribute to her late daughter, leaving audience members like Beyonce and Soulja Boy in tears. R&B singer Monica was vocally top-notch as she sang “I Love the Lord,” a gospel song once sang by Houston; Brandy sang two upbeat Houston hits, “I Wanna Dance With Somebody” and “I’m Your Baby Tonight.” Chaka Khan blazed the stage with “I’m Every Woman,” which Houston remade. Gary Houston, Whitney’s brother, also performed; and Houston’s “Waiting to Exhale” castmates — Angela Bassett, Lela Rochon and Loretta Devine — also honored the singer. 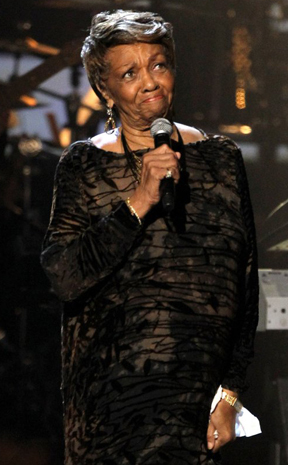 But it was Cissy Houston’s soaring performance that brought the audience to their feet, and had many dabbing their eyes. The tribute came five months after Houston’s death: She died the night before the Grammy Awards of an accidental drowning complicated by heart disease and cocaine use. It started during the opening number by West’s G.O.O.D. music group, which included Big Sean, Pusha T and 2 Chainz. There were long moments of censored silence when the rappers performed “Mercy,” though not all the offending words were bleeped out. Moments later, Jackson, the show’s host, was joined by Spike Lee as they did a comedic version of Jay-Z and West’s hit song “... In Paris,” to laughs. West, the most nominated act of the night with seven, and Jay-Z won the ceremony’s top prize, earning video of the year for “Otis.” They also won best group. When she lost video of the year to Jay-Z and West, she playfully hit her husband and laughed. 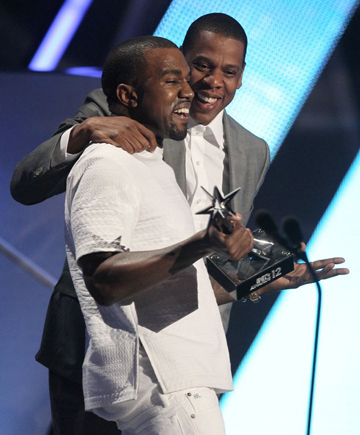 The joking continued: Moments later, as West was giving his acceptance speech, Jay-Z interrupted him and said: “Excuse me Kanye, I’m gonna let you continue, but ...,” and the audience erupted with laughter, recalling West’s infamous interruption of Taylor Swift’s MTV Video Music Awards speech a few years back. Chris Brown was also a double winner, picking up his second consecutive win for best male R&B artist, and the “Fandemonium” award for a third time. Drake didn’t show, though he was named best male hip-hop artist. The tone of night fluctuated frequently, as the show shifted from hotly anticipated performances to solemn moments to irreverence. Usher performed his groove “Climax,” and Minaj sported a blond wig with pink tips as she performed the songs “Champion” and “Beez in the Trap,” which featured 2 Chainz. D’Angelo returned to the television spotlight with his first performance in years as he attempts a comeback. Frankie Beverly featuring Maze were honored with the lifetime achievement award, and they were serenaded with performances by Tyrese, Faith Evans and Joe. The Rev. Al Sharpton received the humanitarian award, and urged the crowd to vote this November. “This election is not just about Obama, this is about your momma,” he said.